Organic sweet potatoes/yams are great as a first food for babies, since they are high in many vitamins and minerals (such as vitamin A, C, E, Potassium, Folic acid, among others), plus they are very tasty. Before making the pure for my baby, I like to bake the sweet potatoes for about 40 min instead of boiling them, as boiling can leech out vitamins. I also add a bit of olive oil, which has many good properties and helps in keeping your baby “regular.” The final result and most important thing is that my baby loves it! 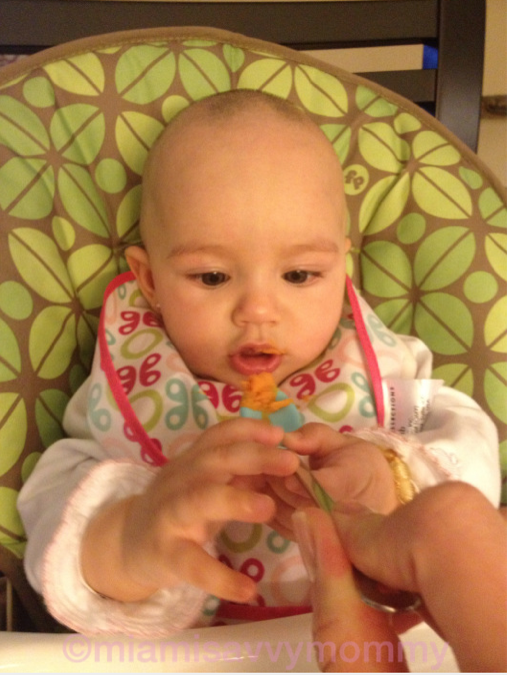 Mia enjoying her sweet potatoes.